Our prestigious customers can avail from us a flawlessness range of Lunch Boxes. 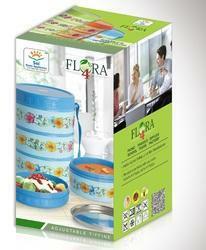 Under the offered range, we provide Flora Lunch Boxes, Insulated Lunch Boxes, Pogo Lunch Boxes. Leak Proof: - Now you won’t have problem of leakage and mixing of food. Adjustable: - Now you can remove or add any number of compartment according to you convenience. Guaranteed Steel: - The inner mirror finished parts are part fabricated out of unbreakable and non magnetic stainless steel. Yogurt Maker: - it can also be used as yogurt maker. Pour pre boiled milk of lukewarm temp. In Tiffin and add a little yogurt place the lid cover on top partly open to allow moisture to escape. After some time place the lid in proper position. Thick yogurt will be performed in about 3-4 hours. Hot & Cold :- Bable is so designed that now you can put hot & cold food as the same time in deferent compartment wash it with lukewarm water before putting hot food and with cold water before putting cold food. 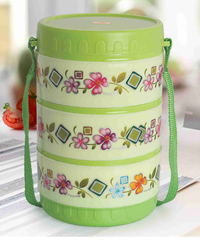 We are among the leading manufacturer and supplier of best quality of Pogo Lunch Box. These small tiffin boxes are perfect for keeping food warm and fresh. Our Pogo Lunch Box small tiffin boxes are ideal for school, offices, traveling, picnic, etc. 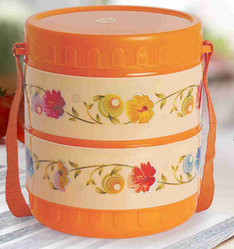 We provide best quality snacko small tiffin box with smooth and shiny containers in different colors and designs. These Pogo Lunch Boxes have tight fitting lids which smoothly seal the containers. 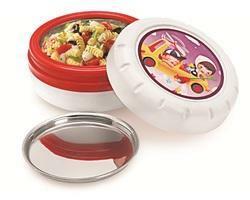 Our Pogo Lunch Box are very hygienic and easy way of bringing home cooked meals.